A Flat Roof or Roll Roof is used exclusively on low-pitch or completely level roofs. Upon tearing the old roof off, Weinel Roofing will inspect the decking to make sure no wood needs replaced. Using the highest quality materials, Weinel Roofing will apply a base sheet to the roof that will allow the top layer, SBS Roll Roofing, to be sealed down. This prevents any damage to the decking wood when the roll roof Weinel Roofing installs is replaced many years down the road, saving you money. 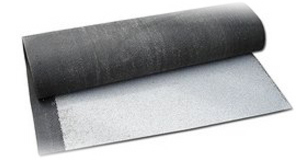 This base sheet also creates an extra level of protection on your roof from the elements. Weinel Roofing offers a free flat roof estimate at your request. A highly trained Weinel Roofing staff member will come to your home and make a detailed technical drawing of your roof and all its properties. We gather all the information we need to create an honest, fair estimate. Shortly after, you will receive a typed contract that describes in detail, all the work that Weinel Roofing will be conducting as the well as the materials used on your roof. In addition to installing a high quality flat roll or roll roof, Weinel Roofing takes pride in a clean, safe work environment. We do NOT use dumpsters, and all trash and refuse is removed from your property at the end of each day. Also the same day we tear off a section of your roof, we cover it back up. When we leave the job site for the day, you can be assured that there will be no leaks in case of an overnight rain.